Not only outstanding in design, Orion also impresses users by its features and functions. Custom menu in header contains blocks. Each block contains one extension : all stores block contains category top extension, new arrivals block contains new products slider extension, hot sale block contains onsale products slider extension, fashion trend contains a nice image and information, about us and popular items are links. Multi Color: 6 color option design available. Responsive Design: It can adapt to any screen resolution. Vertical Mega Menu: Display Mega Menu with a vertical navigation. Category Search: Quick and optimization search with category or subcategory. Top Menu Category: Show category product on top menu. Category Slider: Give you more choice with category slider. Multi Language: Work with any language installed in your Magento. Bootstrap v3 + CSS3: More tightly andlogically with new bootstrap3 and CSS3. Dynamic Layout: Columns, modules and static blocks are arranged dynamically. Customizable Product Grid: You can set how many products per row. Customizable Product Page: Display detailed information of a product. Cloud Zoom + Light Box: Help see clearly product and shop more conveniently. Tab Product Slider: Display products in each tab in different modes in slider. Featured Products Slider: Display featured products logically and beautifully in slider. Brand Logos Slider: Display your manufacturer logos in slider. Compatible With All Browser: Compatible with all browse such as Firefox, Chrome, Safari..
Ajax Add To Cart: Go shopping quickly and conveniently with Ajax cart. 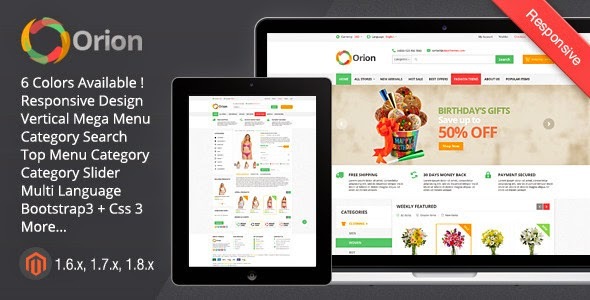 Item Reviewed: Orion - Mega Shop Responsive Magento Theme 9 out of 10 based on 10 ratings. 9 user reviews.